Designation: Conquest Hospital Hastings, East Sussex Healthcare NHS Trust. List of Author(s): Oni T, Sinha P, Stone A, Mostofil B. Copyright: © 2018 Oni T. This is an open-access article distributed under the terms of the Creative Commons Attribution License, which permits unrestricted use, distribution, and reproduction in any medium, provided the original author and source are credited. This study reveals headless crossed compression screw fixation of the MTPJ yields excellent rates of non-union and low rate of complications. 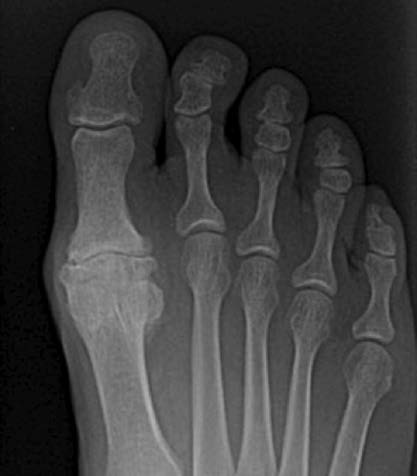 Metatarsophalangeal joint, Hallux, Fusion, Non-union. There are two broad categories of procedures that are used for the surgical treatment of diseases which affect the First Metatarsophalangeal Joint (1st MTPJ) in the foot. The first category includes procedures such as cheilectomy and sesamoid excision which are thought to be sparing to the joint. These procedures make every effort to maintain the anatomical integrity of the 1st MTPJ: they are generally used for earlier stages of diseases affecting the joint [1-3]. The second category is considered to be joint destructive and includes procedures for the fusion, replacement, and resection of the joint . This category of procedures eliminates the true anatomic joint in its native state and is usually reserved for the end-stage of the disease process (Figure 1). End stage osteoarthritis of the 1st MTPJ. Figure 1: End stage osteoarthritis of the 1st MTPJ. Resectional arthroplasty (or Keller procedure) , as well the implantation of a prosthesis are examples of these joint-sacrificing techniques. Fusion of the 1st MTPJ is a well-described procedure which first described by Clutton in 1894 . It has been shown to have a positive, robust and longstanding effect on the pathology of the joint . After its description it was subsequently popularized by McKeever in the 1950s [2,7]. The indications for fusion include end stages of disease such as hallux rigidus, hallux valgus and rheumatoid arthritis [8-10]. A myriad of methods are described in the literature on how this fusion can be achieved ranging from simple Kirschner wire fixation [11-13] to memory staples , locking dorsal plates [15,16] with or without compression and with or without the addition of screw fixation. These different methods of fixation have been reported to show varying degrees of success with respect to rates of non-union, removal of metal work and infection. However, to our knowledge there have been no robust long-term studies that serve to illustrate a clear consensus as to which method of fixation consistently yields the best results and therefore should be used. With that in mind this current study set out specifically to look at outcomes of arthrodesis of the 1st MTPJ using crossed orthogonal headless compressions screws. We performed a retrospective study looking at patients who underwent 1st MTPJ fusion with screw fixation performed by a single surgeon at our institution over a two-and-a-half-year period from January 2013 to July 2015. These were performed using a medial approach to the 1st MTPJ. Articular cartilage was then removed either with dome shaped reamers or excised manually. Fixation was then achieved with two headless compression screws in an orthogonal configuration with reference to each other under fluoroscopy guidance. Initially guide wires were inserted and once secured in a satisfactory position these were followed by cannulated compression screws. The heads of the screws were left buried within the bone surface to reduce likelihood of loosening and therefore removal (Figure 2). Fluoroscopy image of final position of crossed headless compression screws. Figure 2: Fluoroscopy image of final position of crossed headless compression screws. All patients included in the study had the same rehabilitation protocol. This involved immediate mobilization with full weight bearing in a heel shoe for two weeks before having a slipper case fitted for a further four weeks. Radiographs were taken at six weeks post-operatively and patients were reviewed at six-weekly intervals until radiological or clinical union. A total of 42 patients underwent a 1st MTPJ fusion in the time period allocated for this study. This comprised 27 females and 15 males with an average age of 57.6 years (range 41-78). Of the cohort of patients included, 40 had the procedure as a result of end stage osteoarthritis and two due to rheumatoid arthritis. The mean follow up was three months (6 weeks–18months). At the time of submission there were no known cases of non-union or infection within the entire cohort, with only one case of hardware removal, which occurred six months after surgery and was secondary to soft tissue irritation. This is an overall complication rate of 4%. This study shows that the use of crossed headless compressions screw results in very favorable union and complication rates. The arthrodesis of the 1st MTPJ is the gold standard treatment for a plethora of varying pathologies affecting the joint. As a result, it is therefore vitally important to try to ascertain the most effective method of fixation of the joint in order to achieve the best clinical results. 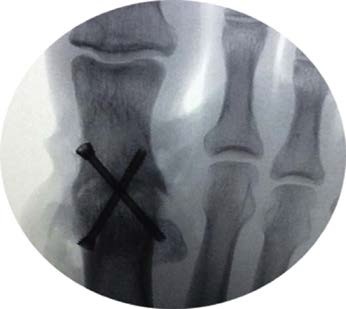 Many methods of fixation for arthrodesis have been employed not only by the lead surgeon of this study but also many members of the foot and ankle surgical community. A recent systematic review conducted by Roukis analyzed 37 studies with over 2,800 patients who underwent a 1st MTPJ arthrodesis via different surgical methods . This showed a non-union rate of 5.4%, in line with widely accepted limits of normality. Furthermore, the rate of hardware removal was 8.5% which is lower than the often-quoted figure of greater than 10% removal rate. In an attempt to reduce the rates of non-union of the 1st MTPJ following fusion and other complications, which might lead to removal of hardware or infection, this centre achieved satisfactory fixation of the joint using the two headless compression screw technique only. As a result, we have found that this method dramatically improved the observed rates of non-union and the subsequent rates of hardware removal. We feel these lower rates of non-union may well be due to a more dynamic construct of the joint which allows for comparatively increased micro-motion that acts as a stimulant for bone healing. Furthermore, the low rate of hardware removal is likely due to the lower profile of hardware used which is imbedded within bone in order to improve compression. This has the benefit of reducing the opportunity for loosening which may cause prominence, irritation and subsequently lead to removal of hardware. Even though we appreciate the small numbers included in this study, we believe that crossed compression screw fixation of the 1st MTPJ is the most reliable method to achieving union with minimal complications and therefore a satisfactory outcome. Moving on from this, we suggest that further studies look to compare the complication rates between the two headless compression screw technique and other methods over a longer period with more cases. With reference to a suitable outcome scoring system such studies could serve to highlight the surgical rates which yield not only the best outcomes for the patient but also the lowest rates of observed complications.